The generation that likely had the most to lose during the crash in the housing market appears to have gained the most household wealth since 2007. 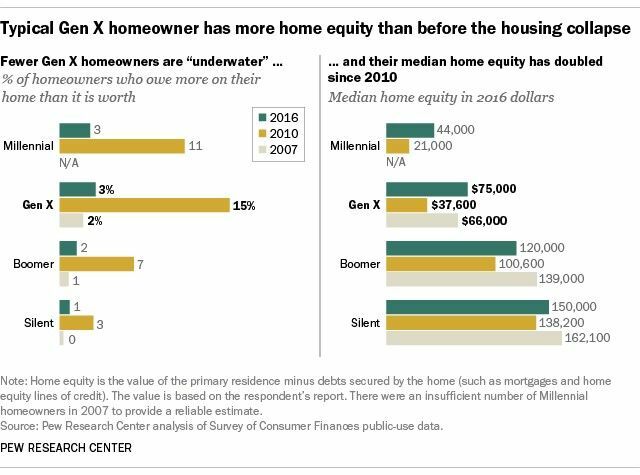 During the economic downturn a decade ago, Generation X homeowners — born between 1965 and 1980 — experienced the largest decline in home equity, according to a new report by the Pew Research Center, a Washington, D.C.-based think tank. Home equity for that generation of homeowners fell 43% from $66,000 in 2007 to $37,600 in 2010. The median value of the financial assets owned by Generation X households fell 20% from 2007 to 2010. Since 2010, the median net worth of Generation X households has risen 115% and, since 2016, the net worth of a typical Gen X household had surpassed what it was in 2007 ($84,200 versus $63,400). “As of 2016, the median wealth of households headed by Boomers and the Silent Generation remains below 2007 levels, though their household wealth still exceeds that of Generation X,” wrote Richard Fry, a senior researcher at Pew. A look at Generation X homeownership. Generation Xers were hit hard during the Great Recession. From 2007 to 2010, the median net worth of Gen Xers fell by nearly half (45%), according to Pew, with declining home equity accounting for much of the . However, Gen Xers are in their late 30s and 40s now, and they are — at least in theory — nearing their peak income and spending power. Gen Xers make more money than the average millennial, by virtue of being older and farther along the pay scale. In 2018, there’s both good and bad news for homeowners and house hunters. House prices are soaring and, despite warnings from some analysts, most Americans believe they will continue to soar. A majority of U.S. adults (64%) continue to believe home prices in their local area will increase over the next year, a recent survey released by polling firm Gallup concluded. That’s the highest percentage since before the housing market crash and the Great Recession in the mid-2000s. The property market has gained steam in the last 12 months. The national median list price now rests at approximately $275,000 roughly 20% higher than in both March 2015 and March 2005. Between 2015 and 2016 the national median listing price only rose 4.8%, but rose by 7.4% over the last year. And yet some housing analysts are less optimistic than many people surveyed by Gallup, forecasting a downturn in house prices by 2020.